Disney’s latest 3D CGI explosion takes a look into the land of Oz before Dorothy left her mark in the 1939 classic The Wizard of Oz. The classic film means the world to me as I have many fond memories involving that movie. I love seeing new interpretations of the story, but at the same time maybe I am too judgmental of them. 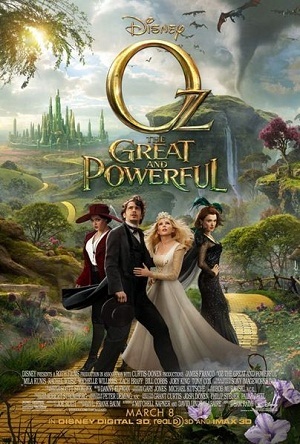 Oz, The Great and Powerful takes on the story of the Wizard and how he came to the land called Oz. Oscar “Oz” Diggs is a struggling magician in a small carnival circuit. His trustee sidekick Frank (Braff) is always there to assist him with his illusions. He is revealed to be a fraud when he cannot cure a wheelchair bound girl (Joey King) who cannot walk. That same day Annie (Williams), the woman he loves, breaks the news to him that she is choosing to be with another man, John Gale. A storm approaches and Oscar takes off in his hot air balloon as a circus strongman comes after him. Oscar gets sucked into a twister and makes a promise to God that he will become a good man if he survives. Oscar’s world of black and white turns into technicolor as he lands in the magical colorful world of Oz. The witch Theodora (Kunis) approaches him and informs Oscar that he is the great Oz that is destined to save the land of Oz and become king. The Wicked Witch killed Theodora’s father who was the previous king of Oz. Theodora and Oscar travel to the Emerald City where Thedora’s sister Evanora (Weisz) stands guard over the throne awaiting the new king. Evanora tells Oscar he must find the Wicked Witch and break her wand in order to destroy the curse. 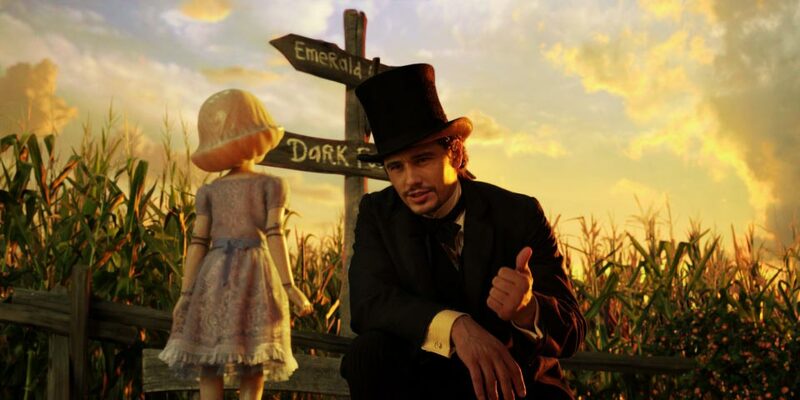 Oscar sets outs to find the Wicked Witch and along the way joins forces with Glinda the Good Witch (Willims), a porcelain China Girl (voice of King), and Finley the Flying Monkey (voice of Braff). I have a love/hate relationship with movies that fully rely on CGI effects to carry the movie. If done well likeThe Lord of the Rings trilogy or Life of Pi, the worlds and special effects come alive and seem all the more realistic. On the other end of the spectrum lies movies like Alice in Wonderland and The Mummy movies. For me, these movies seem fake from the first frame. Unfortunately, Oz, The Great and Powerful falls under the second category. Back in 1939, there was no CGI to make Oz or the Emerald City. There is a magic, mystery, and wonder that comes along with having real sets and effects. All of that seems to be lost when you feel like you know the actors are just standing in front of a green screen. For a movie that is supposed to be about a magical wizard, that magic and illusion seemed to be missing just like it was with the character. Speaking of something missing from the character, one of the biggest misfires that really hinders the film is the casting. James Franco seems to be way out of his element here. He can be a fine actor, but he cannot get passed the dazed stoner quality he always has upon his face. Franco was Raimi’s third choice after Robert Downey, Jr. dropped out and Johnny Depp passed on it. The idea and thought behind Mila Kunis’ casting seems appropriate but she seems to falter at times as well. 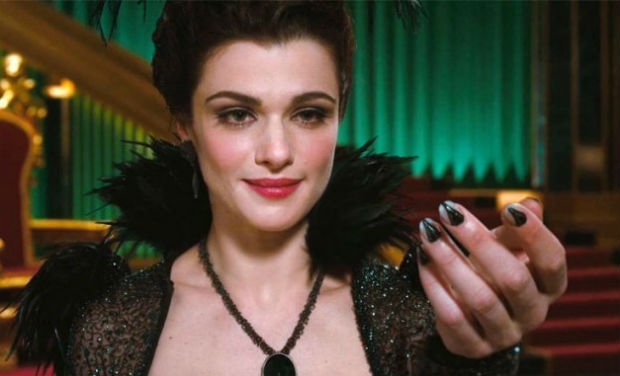 Weisz and Williams give good performances for the material they were given. I think with a better script they easily could have given bigger and richer performances. Two of my favorite actors in the film happen to be the voice work done by Zach Braff and Joey King. I do not know if Finley or the China Doll appear in the L. Frank Baum books, so it is easier to enjoy their performances when you are not constantly reminded of other actors’ portrayals. The movie does have some redeeming qualities. Even though Warner Bros has a tight hold on anything related to The Wizard of Oz, there are enough references and nods to that story that are enjoyable. Could John Gale be the potential father of Dorothy Gale? With Evanora and Theodora being sisters could one of them have a house fall on them in an upcoming sequel? Glinda still travels around at times in a bubble. There are ferocious flying monkeys. I loved the transition between black and white to color. It evokes the same feeling as it did inThe Wizard of Oz regarding the realities of both worlds. Even though I generally found the look of the film to be too CGI fakey, there were moments of stunning visuals. The 3D helps bring those moments out. The movie had all the right ingredients: Sam Raimi, screenplay by playwright David Lindsay-Abaire, Danny Elfman score, and great actors, but the end product turned out to be a huge mess. That is the disappointing part about it. I know many people that will love this movie, and I wish I was one of them. I am not giving much away by saying that the ending sets up for a sequel. I hope the follow-up will be a little darker and more realistic looking. Let’s actually build some sets and models for the next one!